As you have probably guessed by now, I love to find ways for kids to create digital stories. I have a huge list of tools suitable for this creative activity in Creating Digital Stories with iPad. Today I want to tell you about the iPad app, 30 Hands Free. There’s also a Pro version which has all the in-app purchases bundled from 30 Hands Free. 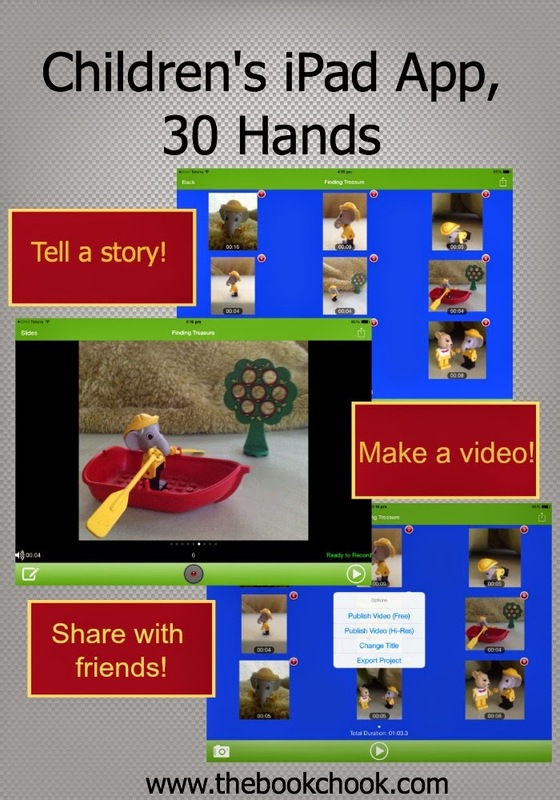 30hands Mobile is a fun, innovative storytelling app that allows students, teachers and anyone with creativity to easily create narrated stories or presentations based on photos, images, drawings or video clips using an iPad, iPhone or iPod. Different from other presentation apps, 30hands Mobile focuses on the power of storytelling and ITERATIVE CREATIVITY(TM). Drag photos, images or video clips around the desktop into the order of the story. Next, record audio over each image. Easy editing allows students to take learning to a higher level and creates a better final video whether created by a student or teacher. Finally, the story or presentation can be published to the device’s photo area or uploaded to a 30hands Cloud collaborative learning site. Registration in the mobile app provides login credentials for the 30hands Cloud Community site at http://K12.30hands.com. The process of creating a presentation with 30 Hands is simple. Once children draw on a slide, take a photo/video or add an image/video from the Camera Roll, they can then edit the order images are in, and record audio for each slide. The resulting creation can be added as a video to the Camera Roll. To make a sample story, I found some pictures on my Camera Roll that’d I’d used in Visual Story Telling, and chose them to work with. They appeared on my screen, and re-ordering them was easy - tap and hold until they jiggled, then move the images to where I wanted. Once done, I clicked on each image and added audio. When the story came together, I told 30 Hands to save it as an MP4 to my camera roll. Other options were available if I’d paid for those or owned Pro. In my iPad's Camera Roll, I found the video and exported it to YouTube. You can see it embedded below. I think 30 Hands is a superb way for children to tell a story. Kids could use it to make a little video to explain how to do something for their classmates, or tell a relative about their birthday party, or to record their narratives for others. Teachers and students could certainly use it for recording science experiments and sharing book reports. For younger kids, it makes a nice vehicle to create a list of alphabetised toys, or to draw and re-tell a nursery rhyme.